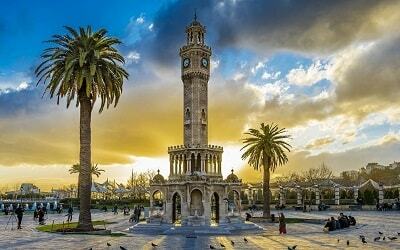 Looking for a way to discover and understand the Turkish culture? 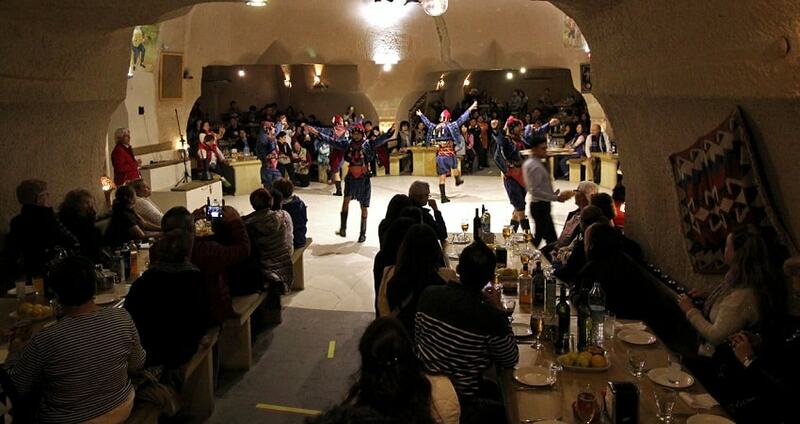 Then, there is no better way to do it than participating in Cappadocia Turkish Night. This excursion will immerse you into the country’s traditional music and dancing. You will get the chance to see traditional music instruments, costumes and taste some of the local delicacies. Experience the fun side of the Turkey and spend a night full of unique moments. 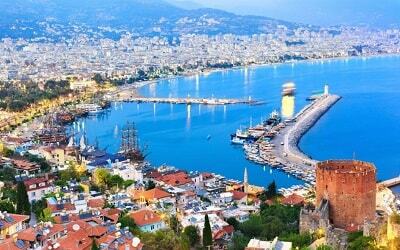 Looking for a way to discover and understand the Turkish culture? 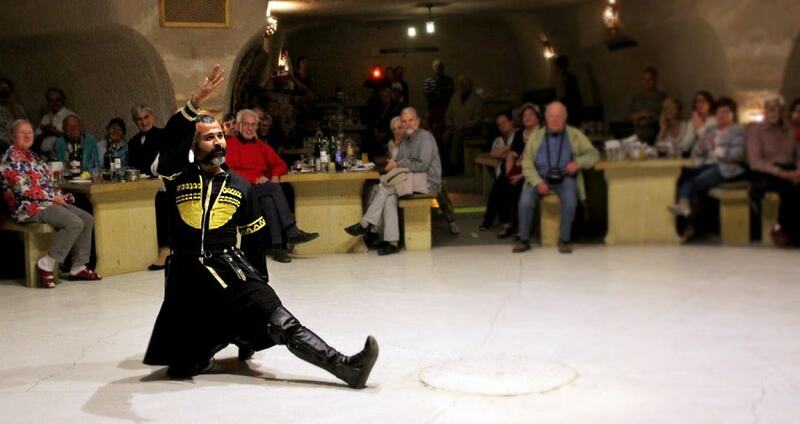 Then, there is no better way to do it than participating in a traditional Turkish Night. This excursion will immerse you into the country’s traditional music and dancing. You will get the chance to see traditional music instruments, costumes and taste some of the local delicacies. 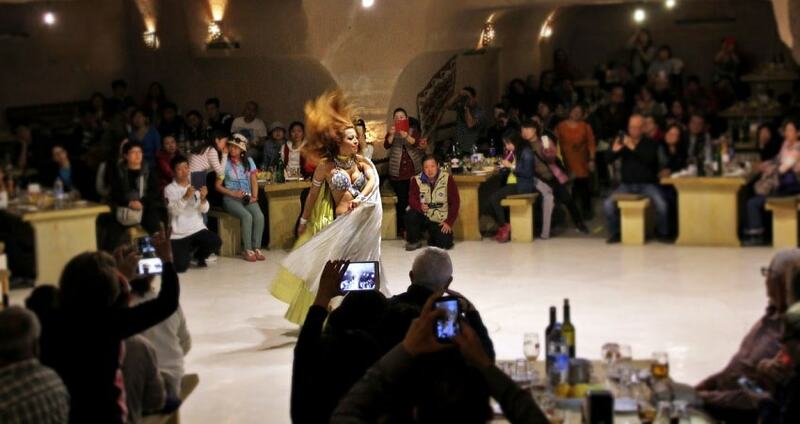 Experience the fun side of the culture and spend a night full of unique moments. Cappadocia Turkish Night starts during the evening, when a vehicle will wait for you at your hotel to pick you up and drive you towards the restaurant. Once you arrive there, you will be impressed by the interesting design that the restaurant has. 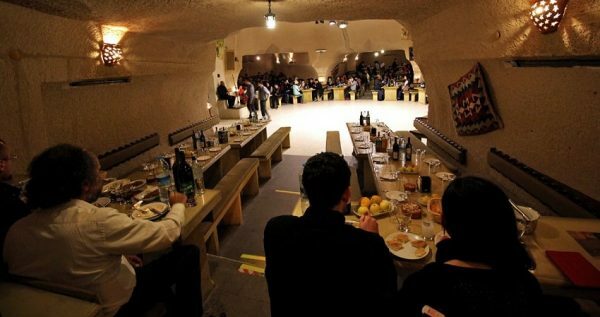 In fact, the restaurant is carved into a fairy chimney and looks like an underground cave. 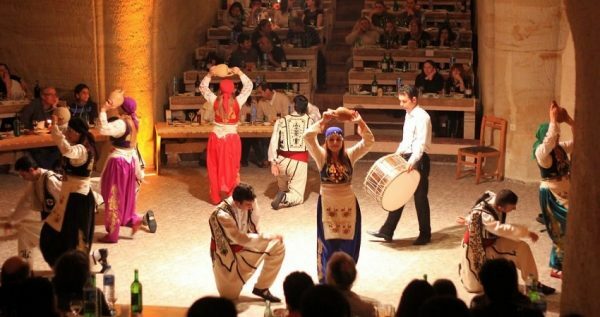 The show includes some of the basic elements of the Turkish culture. You will have the opportunity to see some traditional folklore dances by professional dancers dressed with the authentic costumes. During the show, a representation of the Turkish wedding will also take place. During that particular part of the show, a girl dressed as a bride with a red dress will be dancing in the centre of the stage. The groom will enter the stage and during his show three main elements are illustrated namely, his beauty, how strong he is and his wealth. According to the story, the bride rejects all of his three shows and accepts to get married with him only when he expresses his feelings about her. At that moment, the couple starts to dance and invite all of the guests to dance with them. Join the professional dancers and get to know some traditional moves while on stage. What follows is a variety of other shows and dances from various parts of Turkey. These shows include among others, the infamous belly dance. This dance requires a skilled female dancer with sharp temperament. During her dance, the female dancer will be moving across the tables to pick few men and try to learn them the moves. 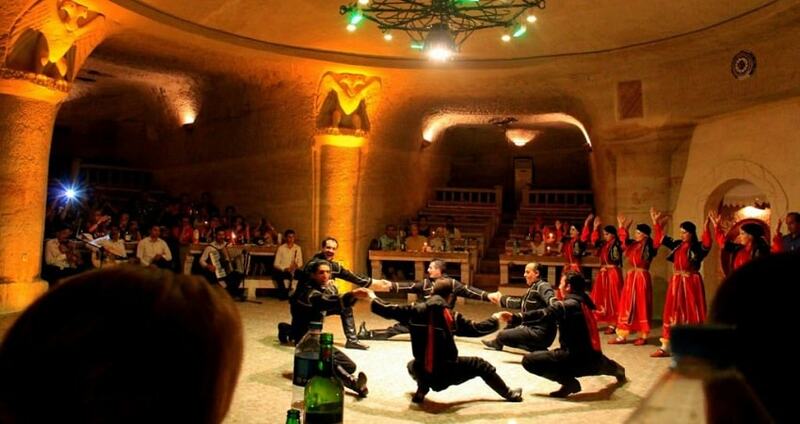 The traditional Turkish Night includes also a fire show, a drum show and a traditional Caucasian dance with knives. 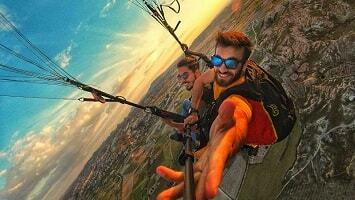 Get ready to snap some amazing photos of your experience. During the night, you will also enjoy a tasty four course dinner with various appetizers, which is included in the price. The dinner will be a traditional Turkish meal with local ingredients and based on a traditional recipe. In addition, during the show you can enjoy an unlimited consumption of soft drinks and alcoholic drinks free of charge. Once the show is over, you will be transferred back to your hotel full of new experiences. 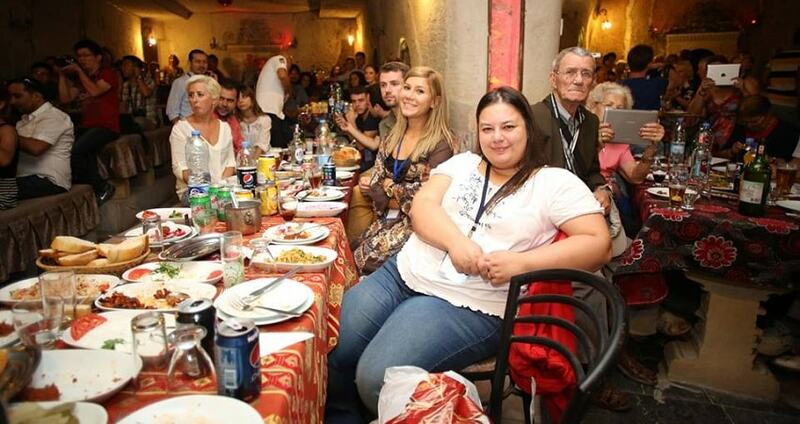 The Turkish Night will be a nice, fun and informative experience from your holidays. Bring your camera and your smile, You'll have a great night! 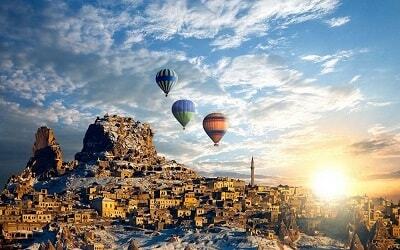 You can see all available Cappadocia Excursions from here. 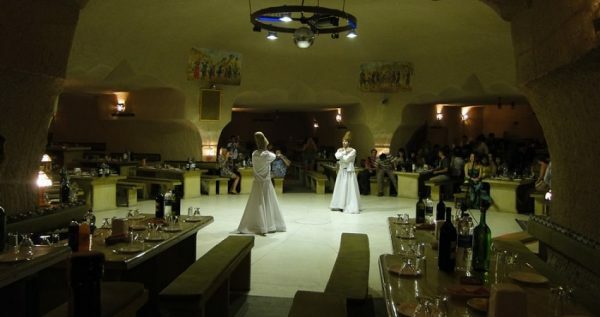 Immerse yourself into the Turkish culture by participating in a traditional Cappadocia Turkish Night. 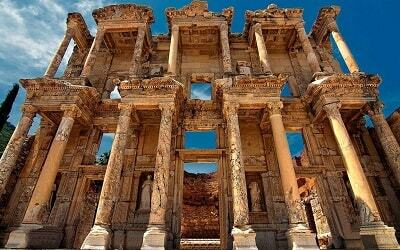 This experience includes everything you need to know about the culture and the lifestyle of people in Turkey. Folklore dances, music, traditional costumes and a variety of spectacular shows is what you should expect. Make you holidays count by experiencing a Turkish Night from first-hand. During the evening of this unique cultural experience, a vehicle will pick you up from your hotel at a scheduled time and drive you towards the restaurant. The restaurant will amaze you as it is carved into a fairy chimney. This underground cave-like restaurant is the ideal location to enjoy a traditional Turkish Night as it provides the perfect atmosphere. Within your time there you will have the chance to see some spectacular shows with folklore dances and listen to traditional music. Professional dancers with the authentic costumes will be performing a fire show, a drum show, and a traditional Caucasian dance with knives. Belly dance will also be performed and the female dancer will pick up few men and try to show them the moves. 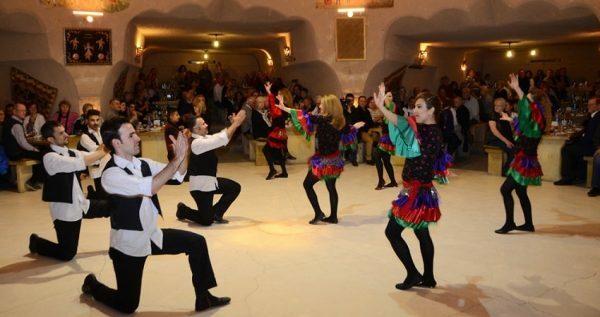 In addition, several folklore dances from different parts of Turkey will also be performed. However, the highlight of the night will be the representation of the traditional Turkish wedding. A girl, wearing the traditional red bridal dress, will be dancing in the centre of the stage. The groom will perform three shows to conquer her. These shows will be illustrating how handsome he is, how strong he is and his wealth. The girl will only say I do by the moment the groom express his feelings about her. During that moment, the couple will start dancing and everyone is invited to dance with them. You will get the chance to learn some traditional moves and enjoy dancing with traditional music. A Turkish Night is never completed without dinner therefore during your time there you will enjoy a four course dinner with a variety of appetizers. The dinner will be made according to the traditional recipes so you will have the chance to immerse yourself more into the culture. Throughout the duration of the Cappadocia Turkish Night, you can enjoy an unlimited consumption of soft drinks and alcoholic drinks to help you enjoy the show. Right after the show, a vehicle will be waiting to drive you back at the hotel. Full of excitement and joy, this experience will be something to remember for a long time.